We were advised on Friday evening (7/12/18) by Turnitin that the issues experienced during the afternoon were resolved at approximately 17:05 and that the service returned to normal. The timeframe for the Turnitin service degradation for both staff and students was 15:15 – 17:05. We have received reports that users are experiencing intermittent issues when attempting to access student submissions in Turnitin Feedback Studio. This issue will display as “503 error” when attempting to load a student submission in the browser. Student work submission is also experiencing slowness and may also be affected. [Update] 15:59 – Students are currently unable to submit. [Update] 16:05 – Some submissions are going through. Intermittent service continues. [Update] 17:55 – Turnitin reports that service has been restored as of 17:05. We have reported this issue to Turnitin and will provide updates via this blog post which is also linked to on the Studies tab in studentcentral. Students and staff cited issues accessing TurnitinUK services this morning for the purposes of eSubmission, marking and also use of the Turnitin Feedback Studio for iPad app. Upon accessing inboxes and submission areas, users received a ‘503’ error. Turnitin Support resolved the issue and notified us at 13.19 on Thursday 25th October. Students and staff cited issues accessing TurnitinUK services this morning for the purposes of eSubmission, marking and also use of the Turnitin Feedback Studio for iPad app. Upon accessing inboxes and submission areas, users received a ‘503’ error. Turnitin Support resolved the issue and notified us at 15.27 on Monday 22nd October. Issues reported on 29th of August: there were intermittent issues with Turnitin overnight and up until 9:40am. During this time users may have been seen a ‘503’ error and would have been prevented from submitting. This is now resolved. At present staff cannot mark in Turnitin if a student submission is not present. Until the issue is resolved you will not be able to use Turnitin to mark without a submission. For more information and advice please see this previous post. Notice: This issue will affect academic staff and administrative staff who use Turnitin to mark when no submission is present. On Monday (23/07/18) we reported an issue to Turnitin Support where the option to mark without a submission is no longer available. This issue continues to persist and we have requested an update from Turnitin Support. 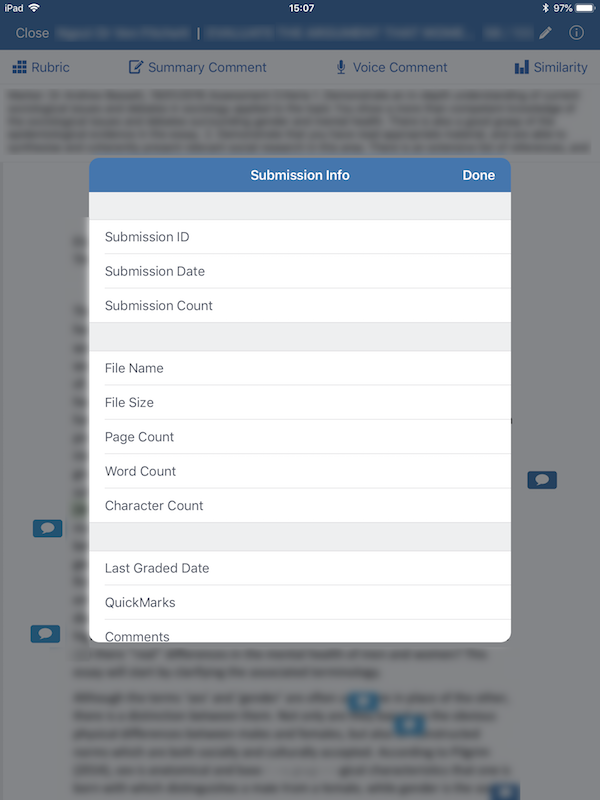 From the Turnitin submission inbox when you click on the ‘pencil’ icon in order to mark without a submission, you may initially see a message to confirm that you wish to mark without a submission. After the initial confirmation, the Turnitin Feedback Studio window does not open and each subsequent click on the ‘pencil’ results in a grey loading animated GIF and no further action. We will update this post as soon as we are notified of a solution. In the meantime if you require an alternative means to mark when no submission is present you can use a manual column in the studentcentral grade centre. If you need to use a rubric with a manual column or require assistance with the use of the studentcentral grade centre tools, please contact your Learning Technologies Adviser. RESOLVED – Please synchronise your marking and install the new version of the app (released on 14/06) from the iTunes app store to resolve the issue. We have been alerted to an issue with the Turnitin for iPad where the ‘information’ or ‘i’ area for a specific student paper is no longer showing submission information. This issue has been encountered by more than one user in more than one submission point. Therefore we suspect that this is a broader issue related to the app update released yesterday. The screenshot below shows how this issue will display in the app. Turnitin Support have been notified of this issue. Recommendation: If you have not yet updated, please do not update the app until further notice. Although no issues with the upload of marks have been reported to us at this time the app should be considered as ‘AT RISK’. As a result we advise that you continue your marking on a computer as a precaution.